Original 1950s French vintage black and white publicity photograph of Brigitte Bardot. 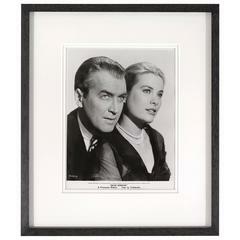 Original framed 1954 photographic production still from Alfred Hitchcock's thriller staring James Stewart and Grace Kelly. Original production still showing Robert De Niro on set with the director Michael Cimino.